NEWPORT, Oregon, June 9, 2012 (ENS) – A large dock from Japan that floated more than 5,000 miles across the Pacific to land on the Oregon coast has been sterilized of non-native species before disposal. The dock, which washed ashore June 5, is debris from the March 2011 tsunami in Japan, the Japanese consulate in Portland confirmed after reading a metal plaque attached to the 165 ton structure. A team of about a dozen staff and volunteers organized by the Oregon Department of Fish and Wildlife made quick work of removing exotic marine organisms from the dock as it sits on the sand at Agate Beach, about one mile north of Newport. 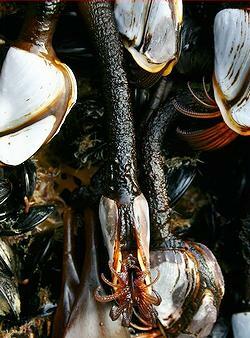 Among the exotic species are different kinds of mussels, barnacles and marine algaes. One invasive marine algae in particular, Undaria pinnatifida, commonly called wakame, was found on the structure. 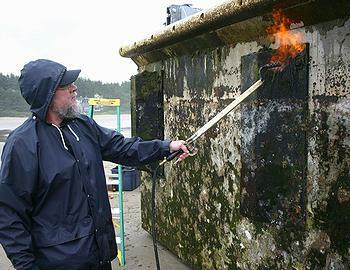 Workers first scraped the 7’x19’x66′ foot dock clean, then used low-pressure torches to sterilize the structure. The ton and a half of plant and animal material removed from the derelict dock was bagged and hauled up the beach well above the high tide line. Oregon Parks and Recreation Department staff and a contractor excavated a hole eight feet deep far above the furthest reach of high tides and storm surges. They emptied the bags into it and filled in the hole. Since the organisms require salt water to survive, this disposal method is considered to be safe and reliable. No further action is expected at the site until a decision is made about disposing of the dock, which should be made next week. The Oregon Parks and Recreation Department says two options are under review – either towing it off the beach to the nearby Port of Newport, or demolishing it on site and disposing of it in a landfill. The reinforced concrete dock contains a large amount of styrofoam, making clean demolition a challenge and increasing the costs for that option. The dock was one of four owned by Aomori Prefecture that broke loose from the Port of Misawa on the northern tip of the main island of Honshu on March 11, 2011 during a magnitude 9.0 earthquake and following tsunami. The department is asking people who want to see the dock to visit at low tide.